Most of us understand the hydrologic cycle in terms of the visible paths that water can take: rainstorms, rivers, waterfalls, swamps, etc. Hydrology takes a different path through a larger volume of water that flows through the air through evaporation and transpiration. This is very different from hydrology as we think of it traveling through visible paths such as waterfalls, streams, rivers, rainstorms, and swamps,etc. Evaporation and transpiration claim 61% of all terrestrial precipitation, and together are referred to as evapotranpsiration. 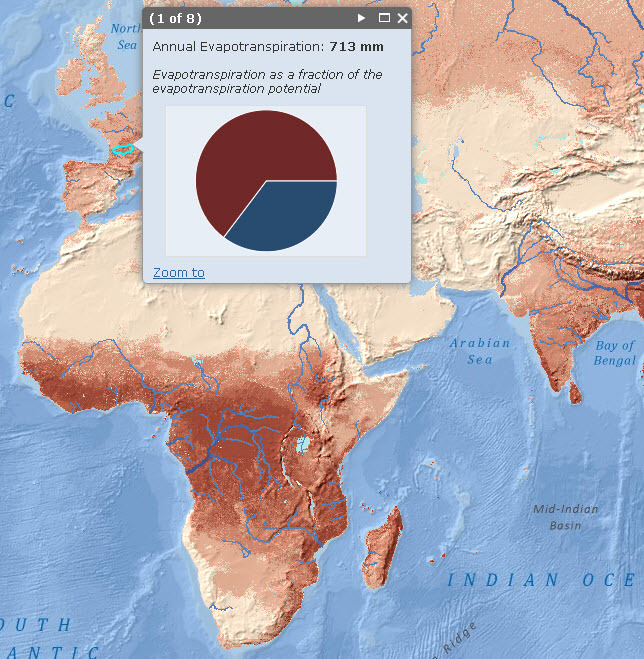 Esri’s Mapping Center has produced a web map showing the world’s average annual evapotranspiration to understand how this process works. This entry was posted on Wednesday, June 20th, 2012 at 2:57 pm. You can follow any responses to this entry through the RSS 2.0 feed. You can leave a response, or trackback from your own site.